Drivewear is the first lens designed specifically to meet the unique visual demands of the driving task. Drivewear lenses uniquely combine two of the most advanced technologies found in the eyeglass industry today: Transitions Photochromic Technology and NuPolar polarization. Drivewear Transitions SOLFX lenses are the first photochromic lenses to darken behind the windshield of a car, allowing Drivewear to change color based on current driving conditions in order to enhance the drivers vision. 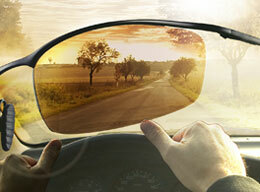 In addition, Drivewear lenses are polarized to block blinding glare, another distinct advantage when driving a car. The only thing about Drivewear Lenses that most consumers don't know is that the lenses do not go completely clear indoors. The tint is about 50% the Overcast Color ( light green ) but the tint is light enough to see indoors. 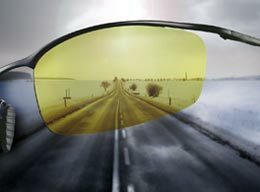 Transitions Lenses are clear indoors but the lenses do not active ( go darker ) behind a windshield where as Drivewear Lenses do. Low Light/ Overcast - Drivewear lenses remove glare and maximize useful light information reaching the eye for optimum visual accuity. At low lighting conditions, Drivewear lenses provide high transmission of light to maximize the total information to all the eyes visual receptors. This results in maximum visual acuity at this low lighting level. The high contrast polarizer removes glare that would otherwise destroy vision in low light conditions. In this stage Drivewear lenses are a high contrast green/yellow color. Simply, there is no better designed lens for either outdoors or while driving under low light, overcast conditions. Bright Light/ Driving - Drivewear lenses remove glare and control the intensity of light reaching the eye for optimum visual. accuity. 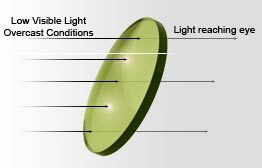 During bright light conditions behind the windshield of a car, Drivewear lenses provides lower overall transmission to control light intensity for optimum visual acuity. Drivewear lenses promote preferential activation of the eyes red cones (and to a lesser extent, green cones) and result in the best possible vision at these higher light levels. Drivewear's high contrast polarizer is absolutely essential behind the windshield of the car, because it blocks out blinding glare, one of the most dangerous of all driving hazards. 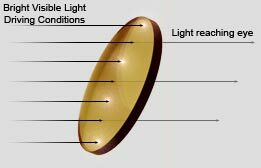 Under these conditions, the Drivewear lenses turn a copper color which many feel is the optimum color for a driving lens. This unique behind-the-windshield response protects against bright light and glare and provides better sensitivity to the visual signal that is vital for safe driving. Very Bright Light/ Outside - Drivewear lenses remove glare and provide maximum filtration of excess light for optimum visual comfort and accuity. 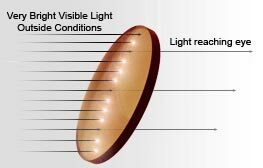 In outside bright light conditions, the eyes visual receptors, the rods and cones, can easily get overpowered and oversaturated with light. 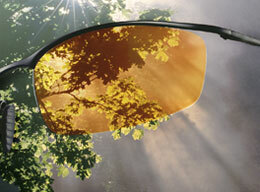 Under these bright outside conditions the Drivewear lens is designed for maximum filtration of this excess light. It achieves its maximum dark color under these conditions. Here again, it is important to provide maximum protection from blinding glare, and only polarized lenses can do this. Drivewear is designed to provide maximum comfort to the wearer in these high outdoor light conditions. SimplyEyeglasses.com can add Drivewear Lenses to your eyeglasses, sunglasses, prescription eyeglasses, or prescription sunglasses, our lab facility can customize any order so contact us or call us at +1 (866) 665-6393 for further details.